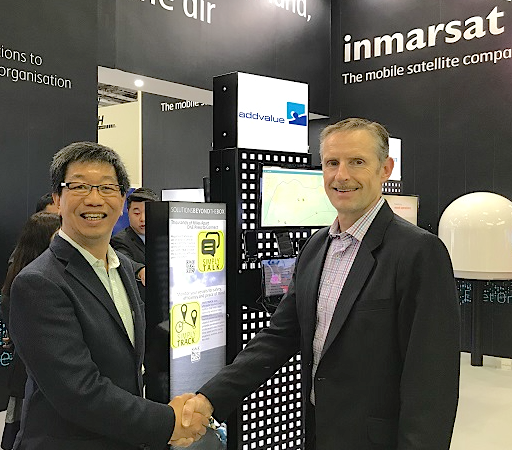 A handshake and an agreement with Inmarsat and flight hardware manufacturer Addvalue, together with a leading satellite operator, will streamline the way that commercial and research operations for small, satellites are conducted. The agreement will allow spacecraft to stay in continuous communications with their operation center on the ground, thereby enabling mission tasking and mission data delivery in near real-time. This will be the first constellation of Inter-Satellite Data Relay System (IDRS™) equipped satellites, one that will provide a momentous capability for satellite operators. Addvalue has worked with Inmarsat to develop a terminal suitable for deployment on a wide range of satellites, even down to small satellites within the sub-50 kg class. Previously, Low Earth Orbiting (LEO) satellite connectivity has been limited to when the spacecraft is within line-of-sight of a ground station. This delays in-orbit testing, mission control and fault-finding efforts. With IDRS on-board, satellite operators will have access to on-demand, 24/7, near real-time, two-way IP-based links to all of their assets. This will allow them to respond to customer requirements and to operational anomalies in a timelier manner. The Addvalue terminal on board the satellite will communicate to its operations center via Inmarsat’s global network. The geostationary network is suited to delivering IDRS — a cost effective, low-latency, on-demand data communications system — to support commercial and scientific missions. The combination of lightweight and small form factor on-board equipment plus low cost makes the system ideal for carrying out telemetry, tracking, and command (TT&C) communications and mission tasking, receiving mission data monitoring, trouble-shooting and restoring operations. Dr. Colin Chan, Chairman and CEO of Addvalue, commented that they are truly pleased to announce the signing of their first IDRS contract with a satellite operator. They believe their customer’s use of IDRS, with its unrivalled communications capability, will significantly improve the operational efficiency of their multi-satellite Low Orbit Earth constellation. This contract recognizes the unique value of IDRS and they strongly believe IDRS will disrupt the way future commercial and research satellite constellations are operated. They are fully committed to ensuring its successful delivery as they pursue other IDRS projects and grow their IDRS customer base. Indeed, some of these projects are already in an advanced stage of discussion.